Lake Nakuru is one of the alkaline Rift Valley lakes and a fantastic bird sanctuary. Its shores are eye catching being home to more than one million flamingos. 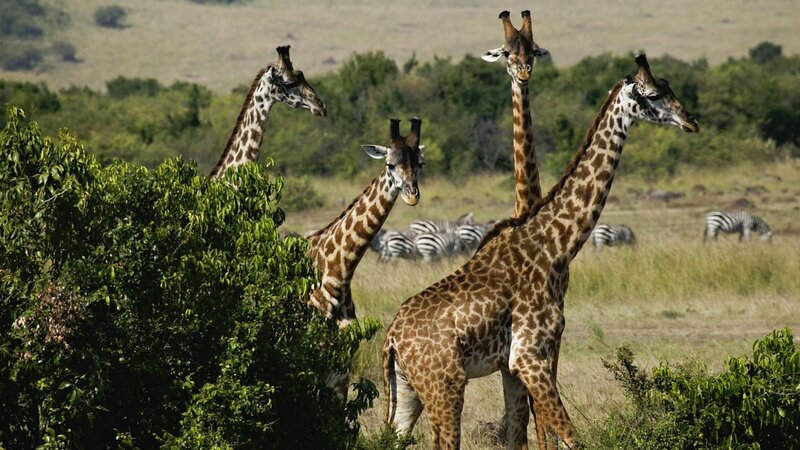 In addition you can find other birds species, leopards, lions and rhinos at Lake Nakuru national park. The Masai Mara is a Game Reserve and widely known as the migrating land of animals. It is sometimes referred to as a National Reserve. The Masai Mara Game Reserve is simply referred to as the Mara. While at the Mara Reserve you have various options of places where you can board. Mount Kenya region is in the central province of Kenya. This is where we find the re-known Mount Kenya, woodlands and scenery of green vegetation. Pick up from your hotel at 0800 hrs.and depart for the dramatic semi-arid scrub land of the Northern Frontier. Arrival in Samburu will be by lunch time. After lunch embark on a game drive to sight resident wildlife species like the Reticulated Giraffe, Gravy’s Zebra, Beisa Oryx and the Blue-necked Somali Ostrich that are rare elsewhere in the country. Dinner and overnight will be at Samburu Sopa lodge or Samburu Serena lodge. Today you will spend the full day in the Samburu National Park. You will have early morning and evening game drives. All your meals and overnight will be at Samburu Sopa lodge or Samburu Serena lodge. After breakfast depart towards the Mount Kenya region of the country. Arrival at the Serena Mountain Lodge will be in time for a delicious lunch. The unique architecture of Mountain Lodge, with its numerous viewing decks ,balconies and lounges over the a salt-lick waterhole allow for the pleasure of all night game viewing. Dinner and overnight at Narumoru river lodge or Murera spring eco lodge. After breakfast depart for Lake Nakuru. Arrival will be in time for lunch at your lodge, located inside the Lake Nakuru National Park. In the afternoon you will embark on a game drive where you will have the opportunity to spot leopards, rhino and the famous pink flamingos as well as a variety of other wildlife. Dinner and overnight at Lake Nakuru Lodge or Sarova lion hill lodge. After breakfast depart for Masai Mara – the land of vast migrating animals. Arrival will be in time for lunch. After lunch embark on a game drive. Dinner and overnight at Mara simba lodge or Mara Sopa lodge. Full days spent exploring the park in search of the big 5 – Optional balloon safari can be arranged at an extra cost of US$ 450 per person. Dinner and overnight stay at Mara simba lodge or Mara Sopa lodge. Pre breakfast game drives then return to the lodge for breakfast, return to Nairobi where the safari ends. This entry was posted in Kenya Safari Packages and tagged 7 Days Kenya, kenya, Lake Nakuru, masai mara, Mount Kenya, Samburu by Gorillas & East Africa Safaris. Bookmark the permalink.